While many holiday shoppers battle huge crowds on Black Friday or spend Christmas Eve strolling through packed malls, you could have your shopping done well ahead of time. Best of all, our selection of personalized holiday gifts will offer a little something special to your friends and loved ones, and they will receive items that don’t come from a generic department store at the mall. We have something for everyone, whether you’re shopping for a discerning golf enthusiast or a classy hostess. Showing up to a holiday party with a bottle of wine is overdone, but upgrading the gift with an engraved wine gift box can be a memorable presentation on an old classic. 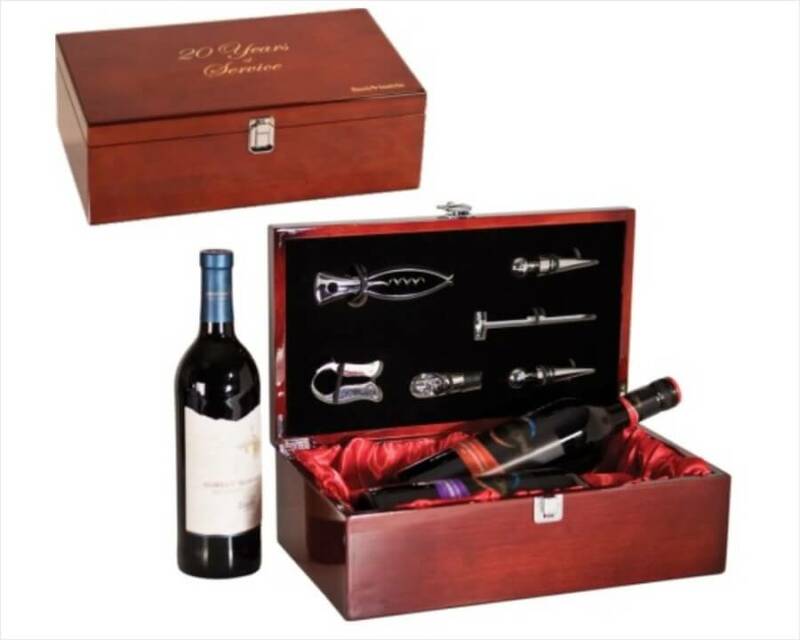 We offer a stunning wooden wine box with a shiny piano finish, and it boasts space for two standard bottles of wine. The interior of the box is lined with red silk, giving the entire display a truly impressive look. Inside the gift box, we’ve placed a chrome foil cutter, a chrome corkscrew, a bottle stopper and a pouring spout. The box is a complete gift that will wow wine lovers and become a point of pride for those hosts who frequently throw dinner parties and cocktail hours. With a bit of whimsy, a bit of professionalism and a whole lot of golf enthusiasm, the crystal golf ball with spinning pen is the ideal gift for any golfer on your holiday shopping list. 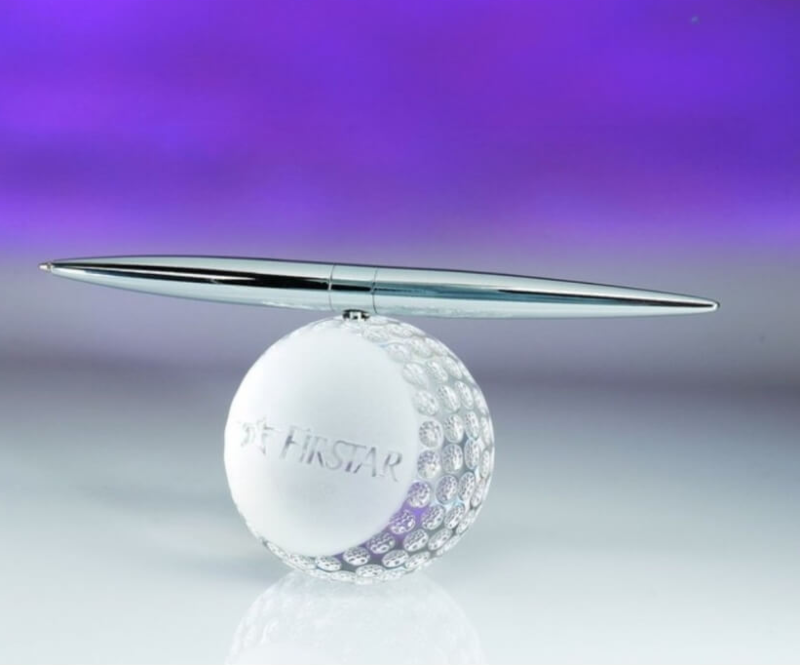 We think you’ll love the sleek, sophisticated look of the crystal golf ball, not to mention the high-quality silver pen that can be engraved or monogrammed according to your specifications. Don’t be surprised if you catch the recipient of this wonderful gift writing you a thank you card with this very pen! While some gifts are specifically for the kitchen, the car or the living room, others are ideally suited for professionals who take pride in their work and their workspaces. If you’re holiday shopping for a professional, put-together person who always boasts an impressive and tidy office, then consider our pyramid marble desk clock. The pyramid shape is unique and eye-catching, and the black color works in any decorative scheme. 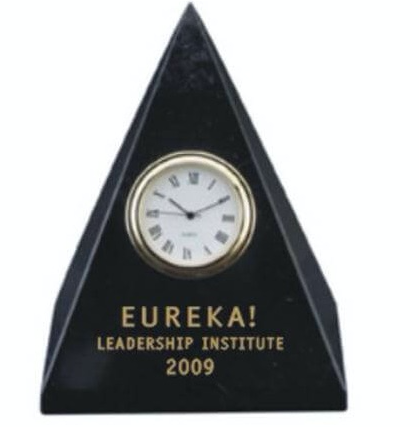 Not only will the item serve as a practical clock and paperweight, but also we can engrave it so that the text highlights a name, company or logo that is important to you or the recipient. Whether you’re an employee who wants to impress your boss with a classy gift or a business professional who wants to let your clients know how much you appreciate them, a non-lead crystal bowl with custom deep engraving is the way to go. For an extra special touch, you can fill the bowl with their favorite candy before presenting it to them. 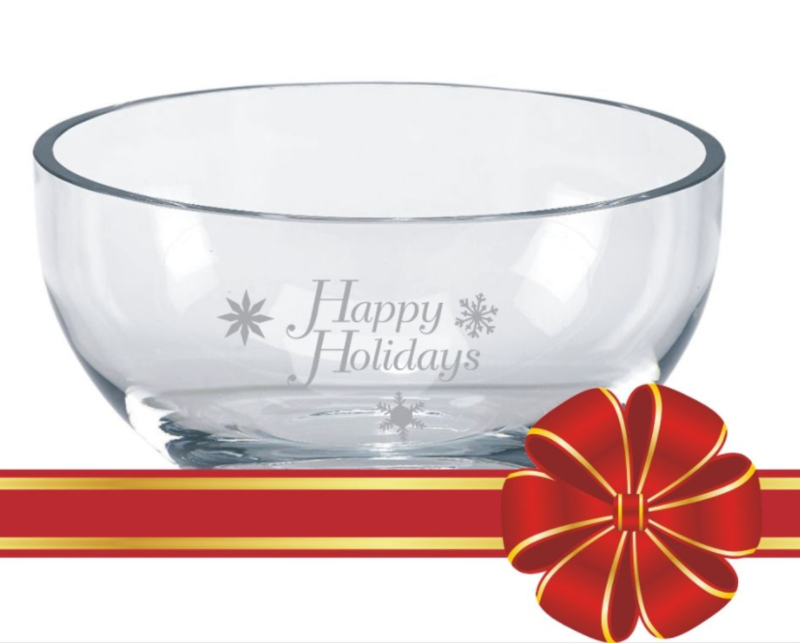 These crystal bowls can be engraved with your best wishes, favorite quote or company logo. 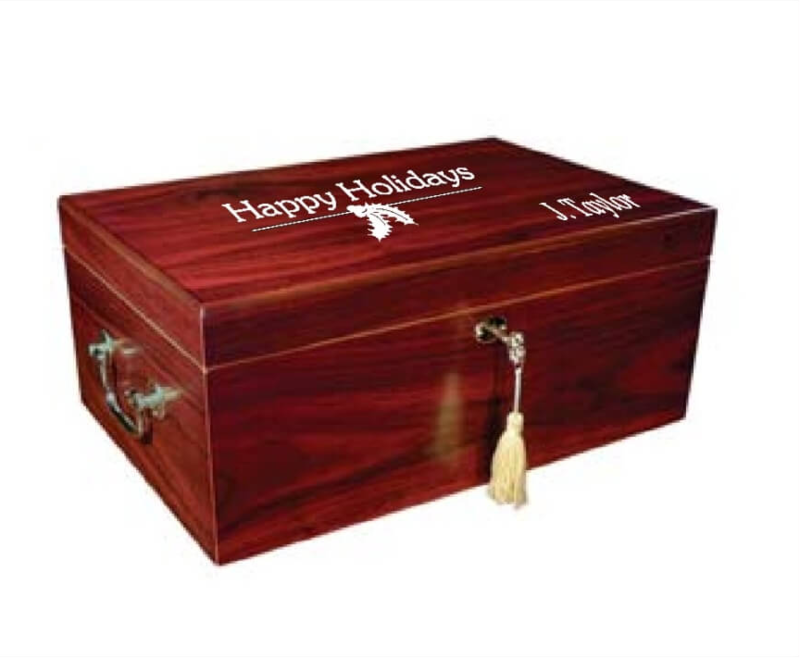 If the man in your life already has the obvious gift choices, step it up and consider an engraved cherry finish humidor. The presentation is the real winner, however, thanks to the stunning cherry finish, the upscale touch of silver hinges and the memorable engraving. We’re happy to engrave lines of text in a variety of fonts and sizes or a logo so that you can convey how important the recipient is to you. Need even more gift ideas? 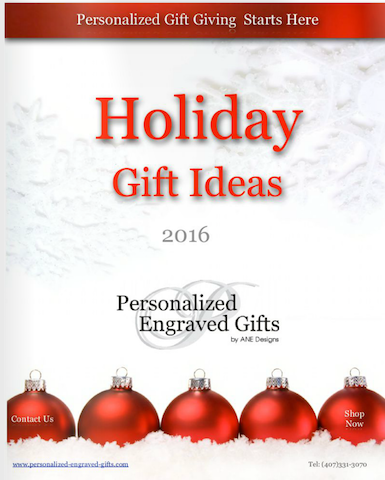 Check out our Holiday Catalog filled with beautiful engraved gift ideas for family, friends and associates. Whether you’re shopping for a sibling, a parent, a neighbor or a friend, the holiday season is the time to express to loved ones just how important they are to you. The best way to convey that is with an equally special gift that is customized for each recipient. We’re delighted to help you find the ideal gifts this holiday season, and we can personalize them to increase their appeal to everyone in your life.